Inspired by another of the state's blended learning programs, Falcon Virtual Academy in Colorado Springs, Snowy Peaks' new center includes a classroom setting in addition to a large computer lab, but also the look and feel of a living room for students to both independently and collaboratively complete online coursework. Behind an inconspicuous gray door on the northwest side of Summit Middle School in Frisco, beyond a bed or multi-colored painted rocks and a welded metal sign affirming its moniker, lies Snowy Peaks, the Summit School District’s “alternative” high school. Just don’t use the term to describe the school around Principal Jim Smith, who is also the program’s English teacher in addition to it’s biggest champion. Snowy Peaks launched in the 2011-12 school year originally as part of a redesigned model for the district’s dropout recovery plan. Now in it’s fifth year, however, the county’s other high school has a different purpose and continues to blossom under Smith, a former Summit High teacher, dean and assistant principal. Among its most noticeable changes is the introduction of a new “blended” educational approach this past fall, which mixes face-to-face instruction and group work with personalized online learning. The adoption of Edgenuity, a highly-ranked, national, web-based platform for the school’s 50 or so full-time students coincides with the rolling out of the new Blended Learning Center. At an estimated cost of between $35,000 and $40,000, in addition to a grant provided by the Education Foundation of the Summit, it allowed Snowy Peaks to convert two middle school classrooms into a single 3,000-square-foot room, repaint, refurnish and rewire for all of the computers, so that it may act as the program’s central learning hub moving forward. The center was completed and has been in use since the fall, with an open-house reception taking place this Tuesday evening. Once inside, the learning environment is as advertised — anything but conventional. 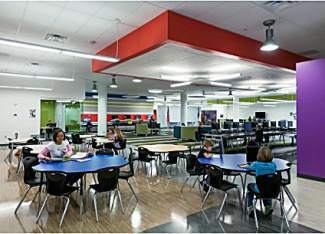 This primary classroom features a computer lab that hugs the wall on one side, but the other offers high-top standing counters, in addition to more traditional circular tables, for collaborative work between students. Next to those are one of the most popular amenities though — a handful of leather recliners where students can lay comfortably with their headphones on and complete work on laptops. That’s not to mention the two microwaves near a pillar in the center of the carpeted room, as well as designated coffee station, for students to take advantage of pretty much whenever they’d like. As for the seminar area located at the front of the multi-purpose space, this too breaks from tradition in its format — a setting more living room than classroom. Underneath bright and modern, exposed white rafters, the nine students present in his second-period class are comfortably seated on either of two black couches or choosing between standing and being perched on bar stools at high-tops. Meanwhile, Smith stands in front of a floor-to-ceiling high whiteboard, and he’s scrawled a brief history timeline in orange dry-erase marker as part of the day’s lesson on mystery and suspense writing. Between chomps of wintergreen gum, he spends the brief teacher-led portion of class comparing the work of Edgar Allan Poe to the popular TV investigation series “NCIS” and reading a Stephen King excerpt before providing each a printout of two-sentence horror stories he acknowledges was pulled from a posting on Facebook. “Some of these are pretty creepy,” he tells them in advance of asking each student to choose their favorite of the list of 20 to share aloud. Hats are prevalent, a relaxed dress code apparent and nary is there a raised hand in this shared dialogue rich with smiles and laughter — much more conversation than lecture. The surroundings may be unique, but what can’t be debated is the product, with each student clearly engaged and their eyes consistently trained on the instructor throughout. “We good?” asks Smith of his students toward the lecture’s end. “Rock ‘n’ roll,” he affirms, using a phrase he says often, commonly coming with it a high-five for a pupil. And then off Smith sends each to pursue their own independent path via their laptops, where every keystroke is logged into the system, allowing teachers to observe progress in real time and assist individually and in a more targeted way as needed in order to not hold others back. This helps explain why he, and many others on his staff of seven, provide students their cell phone numbers and are frequently in touch — be it for help on schoolwork or assistance finding a job, be it early in the morning of a school day or even a holiday. It’s all part of the school’s holistic-driven model that stresses four cornerstones: Academics, Character, Community and Nature. So far there’s been quite a bit of positive feedback. Hannah Dupre, 16, says the personalized approach that the program provides is what drew her to Snowy Peaks. She also acknowledged having social anxiety and a desire for individualized help, but not finding it in crowded classrooms as a freshman at Summit High School. Crabtree is the second in her family to attend Snowy Peaks, after her older brother graduated from the program in 2012. She attended Fairplay High School her freshman and sophomore years, but, after getting into some trouble and having a tough time with absences — which had her questioning graduating on time, if at all — she opted to follow in his footsteps and make the switch. She’s now on track to graduate early. Aside from favorable response with the new blended program, Smith said the results have been pretty remarkable. He admitted there was an initial period of change and discomfort, but that it’s led to a point of clicking for almost everyone, with students having plenty of “aha moments,” as he calls them. So much so that, after running a comparison between the first quarters of this and last year, there’s been significant grade improvement across the board. With its student-to-teacher ratio of fewer than 10-to-1, and graduation requirements that include such things as 10 hours of community service per year, submitting an application to college and a personal project that is the capstone of a larger portfolio, Snowy Peaks will try to persist in pushing the envelope for education in attempting to build well-rounded individuals, all while keeping the student at the center of the curriculum. “A lot of our students carry some wounds from traditional education, for whatever reason,” said Smith. “What we like to think is we’re giving students more control over what they’re learning, when they’re learning, and is it really applicable to (them).